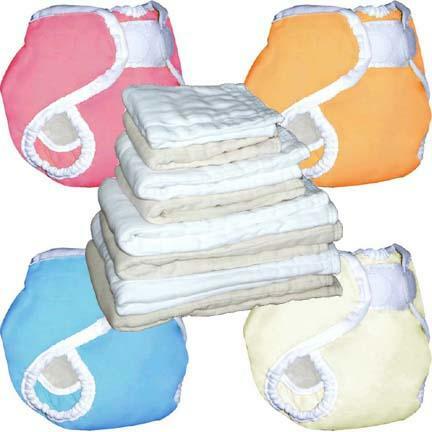 This cloth diaper package comes with 24 diaper service quality Indian prefolds and 4 cute Thirsties covers. This make the perfect starting out package for new cloth diaperers. You'll have everything you need to get started with cloth diapers. NEW! Now you can choose Thirsties Duo Wraps as part of your package! These new covers will fit 6-18 pounds or 18-40 pounds. Soft, absorbent and easy to use, Indian prefolds are also the more durable of the available diaper service quality prefolds. Thirsties diaper covers are our most popular diaper covers by far! These well made covers are soft and waterproof with gentle leg gussets and Aplix hook and loop fasteners mean a snug and easy fit every time. Thirsties covers come in an array of beautiful colors. A very trim fitting cover, you can use these covers and prefolds without pins. just fold the diaper into thirds and lay it in the cover. Fasten the cover around your baby and you are good to go! Covers can be reused several times between washings as long as they don't get messy. Just wipe the inside clean or hang to air out between uses. Thirsties covers are made from 1 layer of breathable PUL polyester laminate. Diaper service quality prefolds and covers are a cloth diapering standard that is hard to beat. They are economical, easy to wash and dry, and very durable. With proper care they should last through more than one child. Washing cloth diapers is easier than you think, refer to the articles section for more detail. PUL covers can be machine washed and dryed. Thirsties covers have gentle leg gussets to provide advanced leakproof protection. The bindings are super soft against baby skin and will not wick moisture onto baby's clothes. The X-Small size features an umbilical cut out for your newborn's comfort. The generous cut of Thirsties Diaper Covers offers a superior waterproof exterior on any type of flat, prefolded, contoured, or fitted cloth diaper. Machine wash warm or hot (below 95 degrees). Dry on low or hang to dry for extended wear. Made in the USA. Due to fluctatuations in supply of Thirsties diaper covers, I can only take requests for boy/girl/neutral colors as not all colors are available at all times.